Annie has held off touching the gift, determined to make the perfect choice. Aunt Emilie has inquired several times, only to be told, "I'm looking,"
Annie has not so much looked as fretted. She can buy a sofa in less time than it takes me to choose a melon, but is absolutely paralyzed in this sphere. Though she has no debt or pressing expenses, there are always practical things to do with a windfall; at the same time, she does not want to disappoint her aunt, and has long dreamed of a special piece of jewellery. She asked me, "What do you think about when you are making a choice like this?" I told her that a purchase of fine jewellery is always going to involve a reconciliation between what captivates you and what you are willing to spend, but that you absolutely should not settle. If nothing speaks to you, keep your money in the bank. 1. Can you see yourself in the piece at least several days a week? Does it complement what you already have? 4. Is the piece beautiful and interesting to you? 5. Is it good value? I have not put "Will it date?" on the list. About 80% of all jewellery eventually looks dated, just like your clothes. 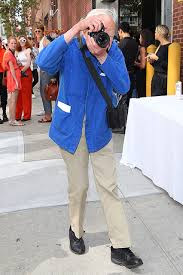 Buy something you will wear often, and enjoy it. You can recycle the precious metal or gems should the piece no longer suit you. If you absolutely want to avoid the "dated" issue, buy well-designed antique jewellery. "What could I get if I spent it all? ", she asked, thinking of Bruce's filly. Left: She could go all in for a stunning Tiffany South Sea pearl and diamond ring. which includes both rose-cut and brilliant-cut diamonds. I bow before its opulence and discreet luxury. Annie could wear it for the next thirty years with pleasure, and for such purchases that is how one should think: long term. Price, $8, 000. So that is about $3,300 per year in today's dollars and might be worth it. Right: I wanted her to consider the resale market. At Beladora, I found an Edwardian ring with a .55ct Old European cut diamond and a natural pearl, set in platinum and 14k gold—I was crazy about that natural pearl (made only by the oyster, no human intervention)—and Annie was impressed by the price tag, $3, 250. That's only about 30% of the gift, and it still would get her a special piece. Sometimes jitters are nature's way of telling you that you are spending too much money. Several weeks after I sent her examples from $3,000 to nearly $10,000, Annie decided to dedicate only 15% of the gift to her ring, so our budget dropped to $1,500. Left: Arts and Craft amethyst and blister pearl ring from Isadora's Fine Jewellery; price $1, 400. Right: Diamonds, pearls and high-karat gold are still within reach. 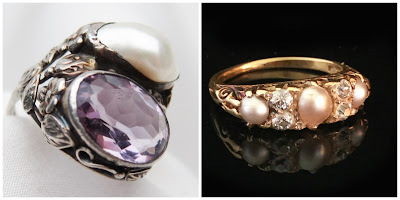 Edwardian 18k gold, pearl and diamond ring from FineAntiqueJewellery; price about $850. For those of us who lack a bequest, there's still pleasing jewellery out there. I showed Annie some of these more modest pieces, partly to position the other examples in the value proposition. If you don't know what you can buy for $500 or less, you don't make good choices at higher price points. 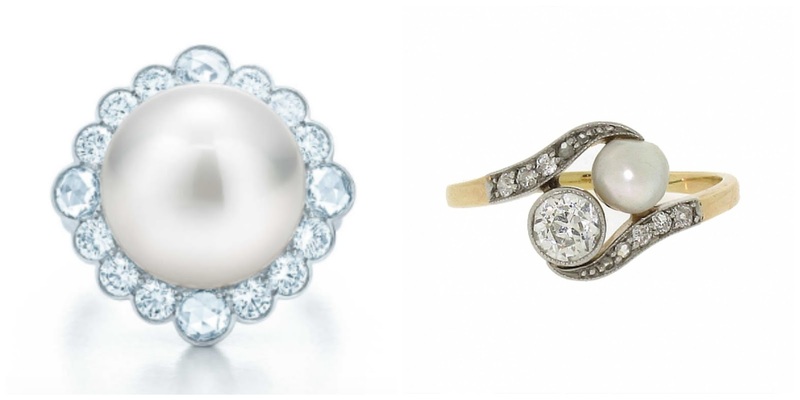 Here, we say goodbye to gold and diamonds, but can still find genuine pearls set in silver. I love this level of jewellery because it evokes jewellers' inventiveness, and when you find an exceptional piece, you get terrific value. 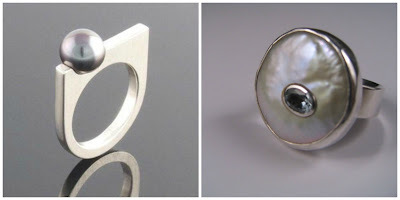 Left: Tahitian pearl and silver ring by Dublin jeweller Eva Dorney; price, €195. Right: Ring of pearl with inset aquamarine by Marc Gounard of Sausalito, California; price, about $190 . Other stones available by request. Annie has not yet made her choice, but is leaning towards the Edwardian pearl and diamonds or something similar. Her aunt awaits her choice, but whenever Annie chooses, the memento will reflect the last line on her aunt's note: "I love you all." What a thoughtful gift, your friend is very lucky. Although not a ring person, I love the first Beladora pearl and diamond Edwardian. Such an elegant design, so graceful and clean. Hope your friend finds what she is looking for. Beautiful choices, as always. 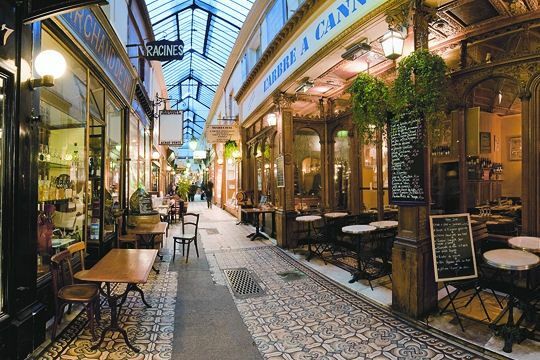 You have such an unerring eye for the most lovely jewelry! I truly love antique jewelry. And those rings are lovely, even though I too am not a ring person (I thought I was alone in that quirk!). A very generous aunt indeed. 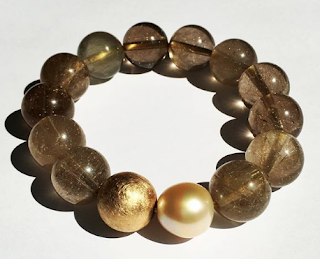 I love the antique jewelry, especially the natural pearl! Jane: Worry about loss is to me unproductive, because any material thing can be lost. You may be interested in this post, "Fine Jewellery: Wear or Worry?" It's a lovely thought, but Emilie is no longer travelling. She wanted to give the gift while she was here to see their pleasure- but time is limited. I'd also have a problem as I couldn't for the life of me seeing myself spending so much on jewellery. lagatta: As I wrote in this post, she spent only a fraction of the gift on jewellery. Yes, it is odd that I missed that. I shouldn't post when I'm concentrating on writing something else (a translation from Italian). I agree with the Edwardian, though I can't stand wearing rings, personally. I love them, but always take them off when working, and have lost them. I love earrings.